Award-winning local author Sneed’s hot new novel offers a clear-eyed story of the effects of celebrity—and the fallout of fame and fortune on family members and others who can neither fully embrace nor ignore the superstar in their midst. Ms. Sneed will read together with Chicago author Shakar, whose novel Lumainarium won the 2011 Los Angeles Times Book Prize in Fictiion. 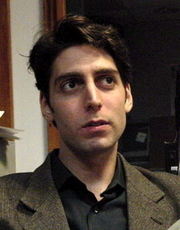 Alex Shakar is currently considered a "single author." If one or more works are by a distinct, homonymous authors, go ahead and split the author. Alex Shakar is composed of 1 name.